Of course, the Chinese military has the mission of neutralizing western Military dominance. This includes a vast amount of disinformation and the current spate of small challenges on small territorial issues in order to perhaps settle borders. I do not thinking that it is working too well and is mostly encouraged by a pacifist President. What has happened is that the informal border state alliance has been reinvigorated and we will see pushback in which the Border States will be quite able to drive a fair bargain. That was not particularly smart and only excusable in terms of internal politics. The military itself cannot be seen as a creditable threat to anyone. This is particularly true on their borders were the military of the Border States are clearly reliable. Thus press releases aside, an actual shooting war must be ruled out. What China does have is a huge educated middle class that owes nothing to the military and has no intention of bungling into a real war. The military has the world’s simplest Strategic position. They are politically united, geographically compact and demographically huge. No border State represents a real threat because of the population advantage which ensures absorption. Their real strategic border is actually the Sea and the short land borders of Vietnam and Korea. The remaining land borders ensure that any attempt will entail a massive investment in infrastructure and you are welcome to go for it boys. All China really needs is an army able to stop either Border State at any one time and to do nothing that ever encourages them to act in concert. That compact army needs to be good and needs fighting experience in concert with western adventures in the Islamic world. The more serious problem has been the spying which has damaged corporate interests everywhere. Pushback on all that has begun and will succeed. A call to tighten military secrecy was issued by China’s Central Military Commission late last month. The People’s Liberation Army Daily quoted the official document, saying its guidelines on secrecy are to help the Chinese military fight and win wars. The document was accompanied by reports in state-run Chinese news services on the value of secrecy. All of this came on the heels of U.S. Defense Secretary Chuck Hagel’s visit to China in early April, where he promised Chinese leaders an increased openness and transparency on U.S. cyberoperations, expecting them to return the favor. 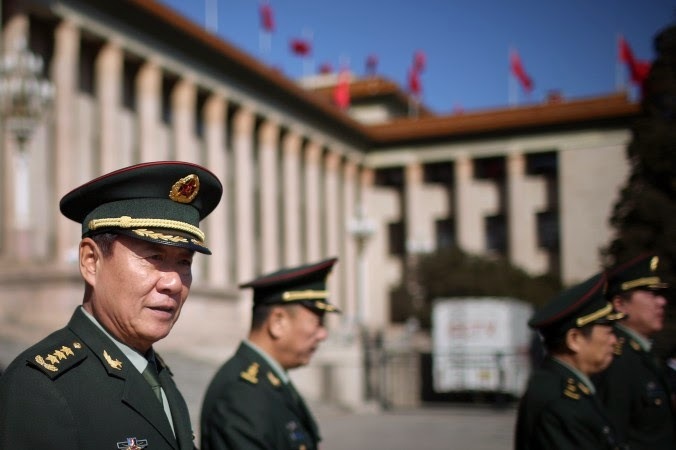 The issues of secrecy in the Chinese military is regularly cited as a prime concern in congressional defense reports and U.S. military reports. China’s defense budget increased 12.2 percent this year to $132 billion, following a pattern of similar increases over the last two decades. The Pentagon, however, believes China’s defense budget is much higher, estimating in 2012 it was up to double the reported amount. There are many experts who question the threat presented by what China shows the world of its military—one of Soviet-era ships and planes, a slow emergence of new technology, and a military and communication structure with doubtful reliability. What is often missing from the discussion, however, is the military China does not show the world — one of hackers, trump cards, spies, and deception. Inside China, people refer to China’s ruling regime as the “little white rabbit.” The term is often preceded by another word, “black belly.” It refers to someone who smiles and seems friendly on the surface, but whose heart and mind are filled with vicious schemes. No analogy could be more accurate. China’s military strategy is not based on strength. It’s based on deception—and the means of deception are the true threat of China’s military. On May 12, China tested one of its anti-satellite weapons, a Dong Ning-2 anti-satellite missile. The Chinese Academy of Sciences said the missile launch was for a scientific mission. Anti-satellite weapons are part of what China calls its “trump card” or “assassin’s mace” weapons. These are systems that would allow the Chinese military to disable certain parts of the U.S. military that it cannot fight. Satellites are a primary target for these systems, since the strength of the U.S. military is heavily derived from satellites—whether for communications or GPS. Ashley Tellis, senior associate at the Carnegie Endowment for International Peace, summed up the issue well during a Jan. 28 congressional hearing. China’s shadowy weapons don’t end there either. They include cyberattacks, high-powered microwave radiation, and electromagnetic pulse warheads. A declassified yet heavily redacted report on China’s trump card and assassin’s mace weapons, released in September 2010 from the U.S. National Ground Intelligence Center, said China could use the weapons as “a surprise measure” against Taiwan or the United States. “These modern trump card and assassin’s mace weapons will permit China’s low-technology forces to prevail over U.S. high-technology forces in a localized conflict,” states the document. In addition to physical weapons, China also employs other military tactics that are even more fitting to its “black belly little white rabbit” persona. A report made public in April, yet released to the Pentagon a year prior, explains that China is using a military strategy of deception it calls the Three Warfares to give it an edge in current territorial disputes in the East China Sea and South China Sea. The Three Warfares, the report states, consist of the manipulation of media, manipulation of international law, and a campaign of psychological warfare. It states China is using this strategy in an attempt to undermine U.S. influence in other countries. Then of course, there are China’s networks of spies, including sleeper agents, handlers, and a large network of informants. China’s frequent use of cyberespionage also fits into this structure. Chen Yonglin, a former Chinese diplomat in Australia, said in 2005 that China had 1,000 spies in Australia. The full scale of Chinese espionage, however, remains unknown. In peacetime—from what we see—Chinese spies are regularly caught stealing intellectual property to advance China’s economy. In wartime, this role would likely change.